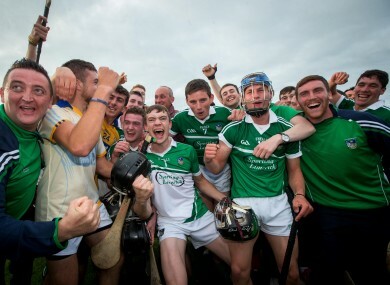 Limerick's players celebrates last night's win. LIMERICK U21 BOSS John Kiely highlighted the switch of Ronan Lynch to full forward as key in beating beat Clare to claim the Bord Gais Energy Munster U21 hurling title at Cusack Park last night. Limerick trailed by four points early in the second-half but turned the game around to fashion a 0-22 to 0-19 victory. And Lynch was central to that as he hit 0-13, with eight of those amassed in the second-half. “They have a lovely running game and we found it very hard to contain it,” said Kiely. “Again we had a lovely lead built up in the first-half, we let it slip before half-time. “At half-time we very worried. We were after playing with the breeze and we were two down and not going great for the last ten minutes before half-time. “We had a good few concerns and made one swap – Tom Morrissey came out in the half-forward line and Ronan Lynch went inside. “That was probably an important move at the time. “Ronan got going inside, Tom got going outside and against the breeze it nearly suited us,” he said. For Clare hurling the loss for their U21′s who were on the verge of their fourth Munster crown in a row, typified their year. The reigning All-Ireland U-21 champions upset the odds to defeat Waterford in a scintillating Munster semi-final in Ennis and their manager Donal Moloney thought his side had believed the hype after that. “They emptied themselves and that as much as we could ask for. “It was difficult to manage expectations after the Waterford game. “That game was a reflection that we out-worked a Waterford team that was probably off colour on the day. “That was the reality of the game, we always knew that as a management team and Limerick were always going to be a different proposition,” said Moloney. Email “The key switch that pushed Limerick to Munster U21 glory against Clare”. Feedback on “The key switch that pushed Limerick to Munster U21 glory against Clare”.